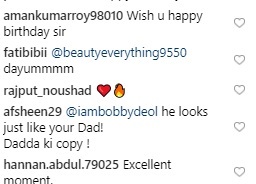 The Internet is apparently head-over-heels in love with Bobby Deol's son Aryaman after the Soldier actor put up a picture of him on Instagram. After the picture went viral, an Instagram user wrote, "I'm love struck... your son... OMG, will he marry me...?" 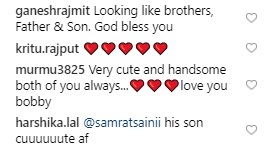 while another comment read: "I'm moving to India, he's so handsome." Bobby Deol posted the picture as a part of his 50th birthday celebration and wrote: "My son is symbolic to this change, finding a friend in his young father. I hope to continue living my life happily with all of you loved ones. I have turned 50 but I'm still always going to be the twenty-something young adult all set to win the world." Bobby Deol is married to Tanya Deol and they are parents to two sons Aryaman and Dharam (named after his grandfather Dharmendra, born Dharam Singh Deol). As of now, the Deols have not shared details of Aryaman's career plans but going by the viral picture, it appears that the Internet definitely wants to see him on the big screen. Veteran lyricist-screenwriter Javed Akhtar says legendary Urdu poet Mirza Ghalib's work could only have found meaning in India. "Manikarnika..." registered the biggest ever opening weekend collection for a woman-led film in the history of Indian cinema. Arjun Kapoor has praised his sister Sonam K. Ahuja for choosing "Ek Ladki Ko Dekha Toh Aisa Laga" and called her courageous. The actor also said he is proud of the actress and his uncle Anil Kapoor for choosing a script they believed in beyond the perceptions of the world. Adjudicating Authority slammed the income tax department authority for issuing the order against Shah Rukh Khan and a company-- in which he, his wife Gauri Khan and in-laws are shareholders-- in February last year.